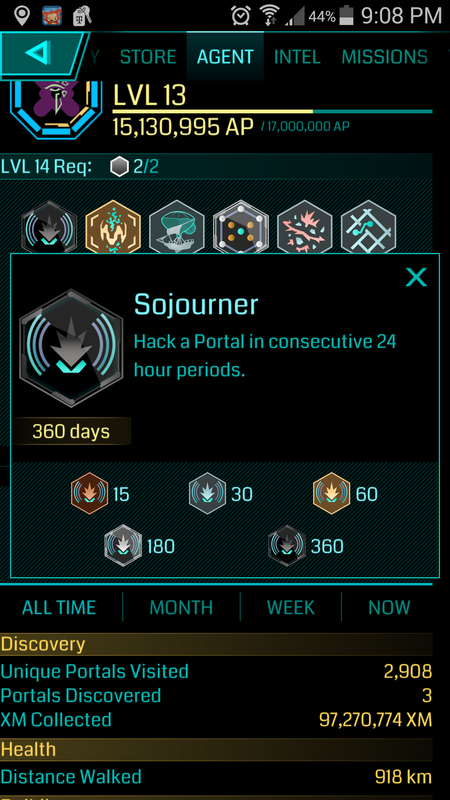 Today I received my last Sojourner medal in Ingress. It’s a deceptively simple one to earn – get within a certain distance of a game portal and perform a certain game action daily. The number of days starts at 15 and increases over time. As of today, I have visited a portal 360 days in a row. The nearest portal is at the end of the block, so not a big trip. At the same time, I’m a bit surprised with myself for this. I grew up being told I’m not capable of consistency because I was not able to keep to diet for years on end. But maybe it’s not that I’m incapable of consistency. Maybe it’s that some things are impossible. This isn’t a Christian blog per se, but I loved this so much I want to share it. When I see Christian churches treat women as second class, and QUILTBAG people as second class, the inevitable and obvious conclusion is that Christianity is a discriminatory and immoral religion, and it is immoral to be Christian. When you speak up, while it doesn’t redeem Christianity in general or all the awful people who promote and believe in discrimination, it does at least make Christianity look not completely morally irredeemable, not a completely unified force of awfulness. I did not make it to all of these, but I do mention them as a sampling of things you might not think would land in a scifi convention. The truth is that cons vary. If there’s interest, a con may include it. Wiscon is a consciously feminist convention, but it’s not the only one to address these sorts of topics. Norwescon has been blessed the last few years to have the creator of Polimicks.com organizing the fannish culture panels. Good: Wearing nifty IGIGI dress from Gwynnie Bee. Bad: Turned my left ankle and fell in my driveway this morning. Bad: Right hip & knee, which I actually fell on, are sore. Good: Hubby brushed off dress. Good: Five compliments on the dress at work today. And it has POCKETS. Uncertain: What does this say about my “normal” clothing? Welcome! Hello and thank you for reading this blog. 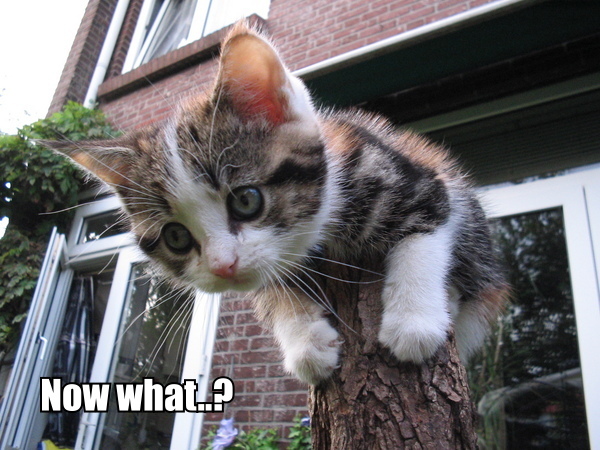 This post is to explain some things so’s to avoid confusing newbies. I started this blog to have a place to talk about fat acceptance and how my life is and isn’t affected by being very fat. Some notable sub-sections are the “Day in the Life” section and my posts on exercise. Do you look like the really fat people used to illustrate stories about overweight folks? Yes, even though most fat people are MUCH thinner than I.
Aren’t people your size common these days? I’m not trying to manipulate my weight up or down. Because losing weight doesn’t work long-term for most people. Including me. But what about health issues caused by being fat? There are no health issues that only fat people have, which makes it hard to believe that weight alone causes them or that losing weight is the only treatment. And, losing weight doesn’t work long-term for most people. Including me. But you agree that if someone is REALLY, REALLY fat then they really SHOULD lose weight, right? Fat acceptance? Tell me more. Fat acceptance, as implied by “fat” and “acceptance” being together like that, is about accepting body diversity instead of focusing on weight loss. On a societal level it’s about fighting weight discrimination and encouraging lawmakers and public health officials to stop the emphasis on weight. More info is here. Do you have a job? You were posting about interviewing. What’s the story? I was “let go”, aka fired, from my software job in October 2010. I started a temp job in March 2011, converted to a perm employee in December 2011, and was promoted in March 2013. The new job pays me significantly better, I feel more comfortable in the work culture, & it has a more walkable workplace than the old job. I consider it a win. What’s the deal with your father? You were posting about him, now you’re not. In the summer of 2010 I realized that my father was drinking to excess again and seemed to be having trouble coping with life. In 2011 I became concerned that he was weakening physically (and in denial). I called social services to help convince my father he needed help. He was hospitalized that spring and diagnosed with bladder cancer, dementia, and decreased kidney function. I took over managing his care, his money, and selling his house. He died in March 2012. I am still dealing with his estate. Mom died over 5 years ago. I’ve lived in or near Seattle, Washington for all my life. I studied computer science in college and work in software. I’m white, married, bisexual, middle aged, wear glasses, sleep with a bite guard and CPAP, sunburn easily, and have naturally curly hair. I drive an 11-year-old Prius. I play computer games like Freecell, Simcity, and Tropico. I’m an only child and not really close to my remaining birth relatives. I have asthma, sleep apnea, vitamin B12 and D deficiencies, some arthritis in my knees, “light bladder leakage”, astigmatism, and a history of depression. It’s Thursday. I made it to Thursday. Monday I took 5 hours out of my day for a training class on interviews (with a special focus on behavioral interviewing, joy) followed by working late. Then my carpool buddy and I drove to the 1 post office still open so he could drop off his tax extension. Tuesday I conducted two 1-hour interviews and a half-hour informational interview and, again, working late while carpool buddy was a morale event. By the end of the day I felt like my brains were mush. Wednesday I had no meetings, no interviews, just work. One of my team members was out, but I still got lots done, including figuring out a bit of code that delighted me. ….and then it was off to the Fairmont hotel for dinner with the man of house at his company’s quarterly dinner thing. I’m grateful that what started as a temp job just over 2 years ago has turned into a place where I’m comfortable, liked, and rewarded. I’m grateful that my boss and coworkers appreciate me. I’m grateful that I can direct the raise into saving for emergencies. I discovered Jeff & Maya Bohnhoff’s parody of “Get Off Of My Cloud” this summer at Westercon. Lately I’ve been listening to it a lot more. Why? My birthday is coming up. I’m going to be 47, which moves me kinda-sorta-maybe closer to my “late forties“. Most of my coworkers are in their 20s and 30s, which increases my feeling old. And I’m in software, and yes, a lot of what I’ve worked with in my career might as well be ancient history. So, taking “a stop-bugging-me, post-teenage-alienation song” and turning it into a “leave me alone, you little hooligans!” song works for me right now. On if the things that WordPress includes in its blog statistics page is “referrers”, aka, links people have followed to my page. Some are perennials, such as search engines and other fat blogs. Recently one was to a forum I didn’t recognize. Curious, I followed it to a discussion of fat and health, where I was cited as being in my “late forties”. Anyway. I’ll be over here waiting for the AARP welcome packet with my hair dye & Daria DVDs. Flonase nose spray, once daily. Singulair & antihistamine, once daily. 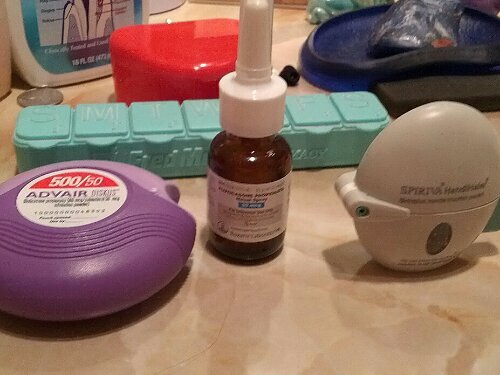 Rescue inhaler, 2 puffs before exercise or as needed. Vacuum several times a week. Weekly wipe down surfaces in bedroom. Weekly spin comforter and mattress cover in hot dryer to kill dust mites. Mattress cover is washed monthly; pillows & mattress have dust mite proof covers. ….and we also dust more often in other rooms, but the bedroom gets the most attention since I am physically there more than anywhere else. But of course, “choosing” to be fat shows I hate the idea of improving my quality of life & I want to be sick. I started this blog to have a place to talk about fat acceptance and how my life is and isn’t affected by being very fat. There are no health issues that only fat people have, which makes it hard to believe that losing weight is the only treatment. And, losing weight doesn’t work long-term for most people. Including me. I was “let go”, aka fired, from my software job in October 2010. I was eligible for unemployment. I interviewed regularly and took a few programming classes. I also started a temp job with more time commitments, stress and a longer commute in March 2011 and converted to a perm employee in December 2011. The new job pays me better, I feel more comfortable in the work culture, & it has a more walkable workplace than the old job, so I consider it a win. In the summer of 2010 I realized that my father was drinking to excess again and seemed to be having trouble coping with life. In 2011 I became concerned that he was weakening physically (and in denial). I called social services to help convince my father he needed help. He was hospitalized that spring and diagnosed with bladder cancer, dementia, and decreased kidney function. I took over managing his care, his money, and selling his house. He died in March 2012. I am still dealing with his estate. Naturally this involves a lot of stress. I’ve lived in or near Seattle, Washington for all my life. I studied computer science in college and work in software. I’m white, married, bisexual, middle aged, wear glasses, sleep with a bite guard and CPAP, sunburn easily, and have naturally curly hair. I drive an 11-year-old Prius. I play computer games like Freecell, Simcity, and Tropico. I’m an only child and not really close to my birth relatives. I have asthma, sleep apnea, vitamin B12 and D deficiencies, some arthritis in my knees, “light bladder leakage”, astigmatism, and a history of depression. I had my first period when I was 10. WHY aren’t I done yet??? I thought it might be helpful to fill in any new folks. Do you really weigh 400lbs? Pretty much, give or take 5%. I’ve lived in or near Seattle, Washington for all my life. I studied computer science in college and work in software. I’m white, married, bisexual, middle aged, wear glasses, sunburn easily, and have naturally curly hair. I drive a 10-year-old Prius. I play computer games like Freecell, Simcity, and Tropico. I’m an only child, dealing with the death of my father this year, and not really close to my other birth relatives. I have asthma, environmental allergies, sleep apnea, astigmatism, and a history of depression. As I got out of the shower this morning I was greeted by the man of the house singing “Happy Birthday” and holding out a plate with Top Pot maple bar (with birthday candle). I was delighted and happy. Sometimes it’s nice to realize that surprises can be good as well as bad. I grew up either on a diet (and craving what was denied by the diet) or off a diet (and eating everything the diet denied). No in between. Now I can and do eat what I want. And I find my wants vary. Some days I really, really want, really crave … a banana. Or something meaty. Or something fresh and crunchy, like a crunchy salad or apple slices. Some times I want a burger. Sometimes I just have no interest in them — or am somewhat repelled by them. I’ve also begun to notice how this is affected by other things. If I get busy at work and don’t eat, I want more energy-dense food later on. If I have a salad for lunch I often want something more substantial for dinner, and vice versa. The weird thing is that I can remember being in a state where passing up food meant deprivation. Now it usually means I’m not hungry, or I don’t care for whatever-it-is. Sometimes this puzzles or disappoints people who want me to provide their “cover” (“They only don’t have calories if I make them for you”). Sometimes this leads to a brief discussion of HAES, sometimes it’s just there. But that’s OK too.